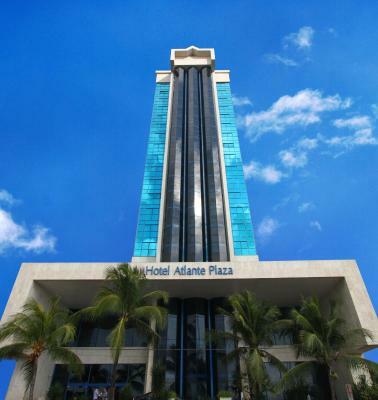 Lock in a great price for Hotel Atlante Plaza – rated 8.6 by recent guests! Staff were really amazing and everything as expected. When I was given one of the non-renovated rooms with a very elevated tub with the shower over the tub and found it very dangerous to get in and out of the shower. I almost had to jump down from over the tub to a very slippery tile floor and slipped upon landing. I spoke with Paula, a very helpful girl at front desk, she worked on getting my room changed to a renovated-walk-in shower with a non-slip mat for floor. I felt much safer after the change. I was in room 802 with the extremely elevated tub (I am 74 yrs old) and found it not safe. Paula moved me up to 1002 which was also on a front corner but on other side of elevators. I felt more at ease and safe after the room change. Great breakfast with champagne and made to order omelettes in the executive lounge! We even book massages in the spa. Great pool! The staff was warm and friendly. The food was excellent. The breakfast brought warm memories of home to my wife whom is from Recife. The pool area was clean and well maintained. Overall an excellent time spent at this hotel. 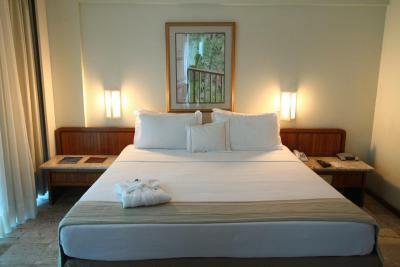 Ocean front, nice location, nicely kept rooms, rooftop pool, great breakfast, free wi-fi. Nice service, bedroom had a good size, good shower. Close to the ocean! Over the street and directly at the beach! Unfortunately the beach is very small at this point. High standard, we got a really good room upgrade! 1st class in the 15 floor! 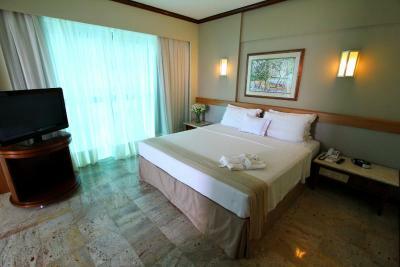 Hotel Atlante Plaza This rating is a reflection of how the property compares to the industry standard when it comes to price, facilities and services available. It's based on a self-evaluation by the property. Use this rating to help choose your stay! 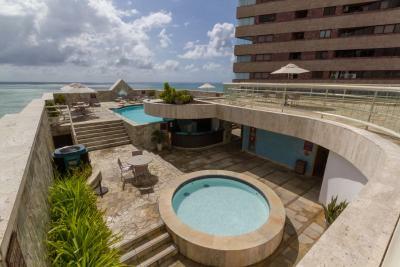 One of our top picks in Recife.The Atlante Plaza is a luxury hotel located in a prime location on Boa Viagem beach and is a 7-minute drive from the city's main shopping center. It features a rooftop pool and a sun terrace. All the air-conditioned rooms at Atlante Plaza feature a mini-bar, a flat-screen TV with cable channels, a work desk and a safety deposit box. The private bathroom includes a shower, free toiletries and a hairdryer. Some suites also boast scenic sea views. Guests can relax in the sauna or work out at the on-site equipped fitness center. The Atlante Plaza also provides free Wi-Fi access. The Aurora Restaurant, located in the lobby, offers a rich and varied buffet breakfast, lunch and dinner service. 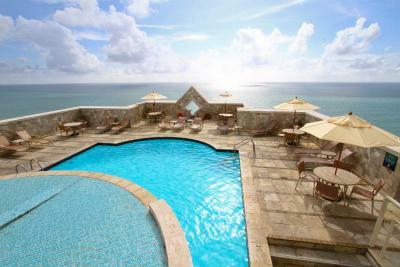 A pool bar can be found on the rooftop. 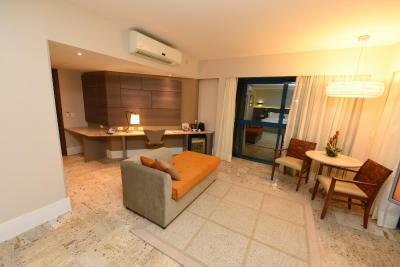 The Atlante Plaza is a 7-minute drive from Recife Shopping Center. Pina Beach is only 3.1 mi away. 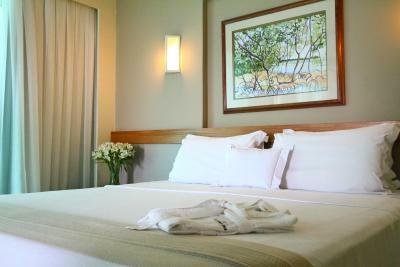 Recife’s historical center and Guararapes International Airport are within 15 minutes' drive of the hotel. At Guararapes Airport, guests have access to Pontes Hotéis VIP lounge. 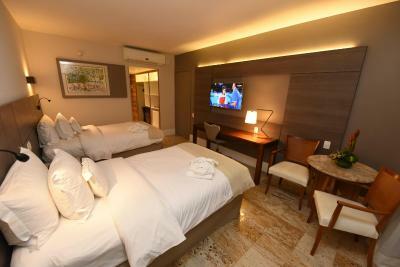 When would you like to stay at Hotel Atlante Plaza? 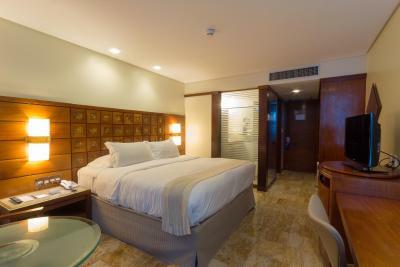 This air-conditioned room features a flat-screen TV with cable channels, a mini-bar, a work desk and a safety deposit box. The private bathroom includes a shower, free toiletries and a hairdryer. Boasting sea views, this spacious suite features air conditioning, a flat-screen TV with cable channels, a safety deposit box, a work desk and a mini-bar. The private bathroom includes a shower, free toiletries and a hairdryer. 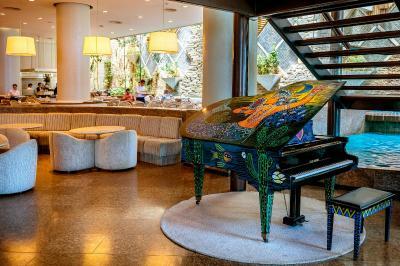 House Rules Hotel Atlante Plaza takes special requests – add in the next step! Hotel Atlante Plaza accepts these cards and reserves the right to temporarily hold an amount prior to arrival. Please note that this property does not accommodate pets. Air conditioning takes a long time to make the room comfortable temperature like. 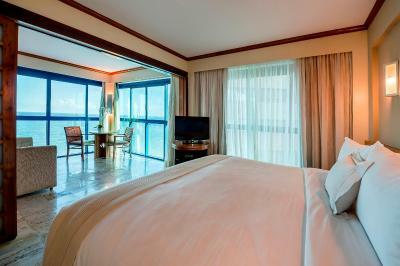 The spacious room and beach view. Air conditioning did not work well, barely kept room moderatly cooler than hallways. It is imperative to have well working AC at this latitude! This would ruin a stay in an otherwise very good hotel for standards in Recife. More than 3 different internet websites advertised FREE BOTTLED WATER and then when I got there they tried to tell me that there was NO COMPLIMENTARY BOTTLED WATER which is very strange for a hotel of this caliber. I had printed from a couple of the websites a re-print of this hotel's amenities and it clearly stated COMPLIMENTARY BOTTLED WATER. I became very insistent and brought out my re-prints and finally Paula was able to get a manager in back room to allow what should have already been offered as promised in the websites for their hotel. The ladies in charge of the MINBAR fridge were very careful to provide me with 2 complimentary bottles of water during my 14 night stay which I appreciated. I did not like the food from the restaurant very much (except the great breakfast). What was even more strange was the same dish (lasagne) was ordered 2 or 3 times and tasted differently each of the times I ordered it. I had impression they even changed the type of cheese they used each time. I tried several other dishes from room service and was not very pleased. There were not many choices in neighborhood without a 6-7 block walk. One block down (towards center) and another block away from beach was a very nice gourmet deli with some nice sandwiches (some hot) and a good Ice Cream shop in same building. The fancy restaurant in the hotel apparently did not make a successful go at opening with a new chef and festivities and then not long after is completely shut down. Only the lobby coffee shop/cafe is not open and not the fancy one in all their ads upstairs from lobby a floor or so. I bought an Executive Suite Room which on most of the hotel websites was the highest priced room and largest size and said would be in a higher floor. When they gave me a room upon check in for a 14 night stay I expected to be given a room on one of the highest floors up to floor 15 but instead was given a non-renovated room on floor 8 (the problem with the jump down tub. Unfortunately the room smells humid... a few days later some water dropped from the ceiling. They repaired it really quick.... but the dropping pipe connection looked be sealed several times. Some reception staff is unfortunately not able to speak English! Overall, there is a great staff in the hotel, but unfortunately there are a few who are not very service oriented! For example: when we were in the pool, we tried to order drinks, however the barman told us it was impossible if we were not paying directly vs. charging to the room! Since we did not have cash on us, no one on the bar of the pool was able to call reception to find an alternative, there was zero pro-activeness to find a solution for it! We needed to leave the pool and go down in the réception to discuss the issue as somehow we could charge drinks to the room. I don’t understand why you can charge things to the room such as mini bar and you can’t put a simple beer ordered on the pool bar to it. Another situation: we got a key malfunction, nothing wrong that happens sometimes! We asked to the housekeeper who was next door to open our room! Her answer: I can’t you have to go to the reception (14th floor down). We had to insist, and she finally got her listing and asked our name to check if we were the right guests! That what she should have done in the first place. A bit disappointed about these situations.. there were stress that could have been avoided, especially if the hotel is considered a 5 stars. There are still basic things to learn in terms of service. The AC does not cool the rooms, they are warm and muggy. Also, the beds are very hard; it’s like we are lying down on concrete. Breakfast too crowded. Lift with problem. A lot of wind noise in the room, not impressed by Boa Viagem, very few good bars and restaurants, quite dead really. 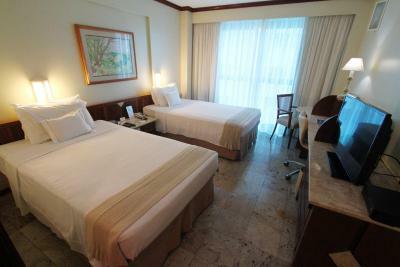 Large room with good view.